Let’s put this one in our Awesome Citizens file. 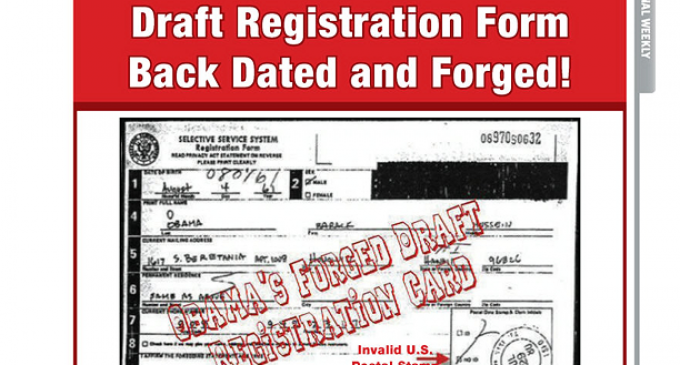 Charles Kerchner, a private citizen, took out a full-page ad in the Washington Times on Dec 9th calling for action on Obama’s fake selective service form and fake birth certificate. The ad also calls out House Speaker John Boehner, claiming he’s been presented with evidence proving the forgeries from a full 2-year investigation by Sheriff Arpaio’s office in Arizona, but he’s done nothing. The story isn’t that someone discovered that B. Hussein Obama is using forged documents to support a false identity as an American citizen able to hold the office of president. Many of us have seen the proof and for most of us it is compelling enough to at least warrant a legitimate and unbiased Congressional investigation. The newsworthy item is that someone else has joined the public push for answers and action in a big way. Charles Kerchner, a private citizen, reportedly took out a full-page ad in the Washington Times, which appeared on page 5 on Monday. He is attempting to force a discussion regarding the use of forged documents by B. Hussein Obama, specifically; his back dated and forged selective service form. A lot of evidence has been presented on the selective service form by the cold posse of Sheriff Joe Arpaio. They did extensive forensic work and involved a variety of experts to examine it, among the many questionable items in the Hussein Obama history. To House of Representatives Speaker John Boehner – We the People Have Been Repeatedly Asked You to Act: Are you living up to your oath to support and defend the Constitution from domestic enemies? Are you doing your job as the leader of the People’s House and protecting we the People from a fraud in the White House? It is time for you to launch congressional investigations into Obama’s forged ID documents or at least get out-of-the-way and stopping blocking those in Congress who wish to do that. You’re office has been given a Sheriff’s Kit by Mike Volin and his team during their visit to Washington DC last week which presents the evidence compiled from a two-year investigation by the Sheriff’s Department of Maricopa County AZ (which includes Phoenix). The evidence proves federal felony document crimes have been committed! Speaker Boehner, are you living up to your solemn oath to support and defend the Constitution from domestic enemies? Are you the leader of the People’s House and protecting we the People from a national fraud being perpetrated on the nation? It is time for you to do your duty and launch a Select Committee to publicly in open hearing in Congress investigate the ongoing fraud and the crimes being perpetrated by Barack Obama. If you will not do that, then step down and get out-of-the-way. We the People demand it! Boehner can’t sober up long enough to deal with any of the myriad problems and issues facing the nation at this point. So he caves to the liberal scum in DC.